On Twitter the hashtag #MeetTheArtist is currently trending. People are drawing cartoony self-portraits, lists of things they like and dislike, and the contents of their handbag. (Why the contents of their handbag? No idea.) So I thought I'd jump on the bandwagon, although I didn't have time to draw a new self-portrait and had to re-use this older one. 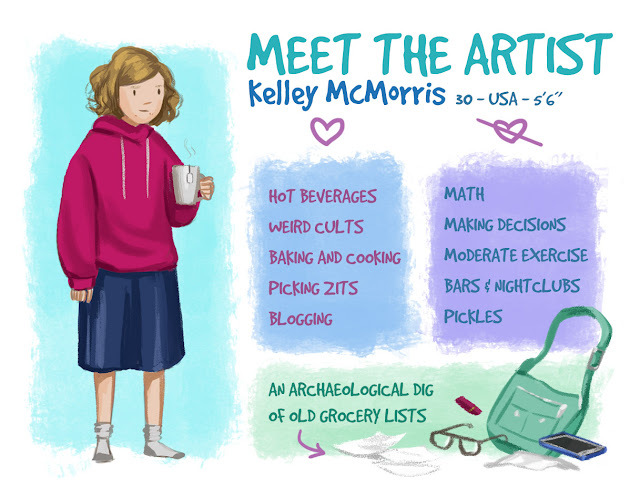 Check out all the other #MeetTheArtist graphics. It's fun to get a sense of who the real people are behind the tweets. And if you're an artist, why not join in?